One short kilometer from the town of Saint-Remy where we were staying, on our way to visit a famous Roman ruin, we passed this. Guinea Pig did a swift and highly illegal maneuver with our rental car and came to a skidding gravel-spraying stop. We climbed out to explore. 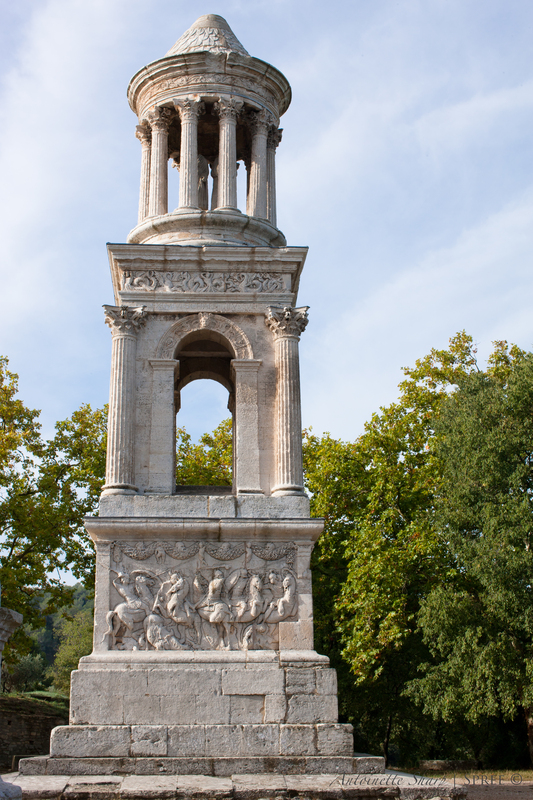 As it turns out, what we’d come across was the Mausoleum to the Julii – erected around 40 B.C.E. 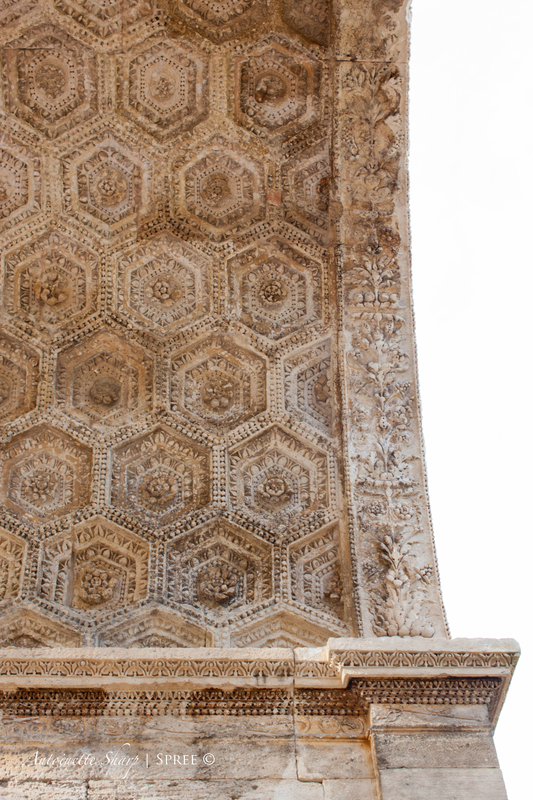 – one of the best-preserved mausoleums of the Roman world. We’d heard about the ancient ruins of Glanum and figured we must have arrived. We expected there to be more to the fabled site than this, but we didn’t see it, so we took our time examining closely what we could see. It was still early morning, hardly a soul up or out. My camera was still pressed to my cheek when Guinea (whose attention span can be a bit short at times – more truthfully, mine a bit long) wandered across the street, wag-jerked his head, lifted his paw and waved. He’d found something. 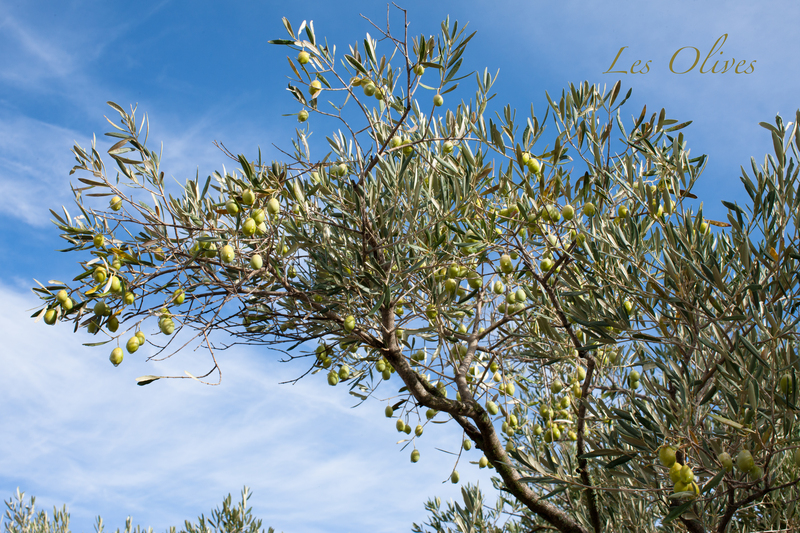 We entered into an olive grove, smelling of wet earth and wood smoke. The green fruit was still dripping from last night’s rain. The first inhabitants, the Gauls, had settled here in the 6th and 7th centuries B.C.E. Pottery and coins indicate that the settlement was established for religious reasons. A celtic god, Glan, together with his benevolent companions the Glanic Mothers, lived in the waters that were believed to have healing properties. The inhabitants name was derived from them. 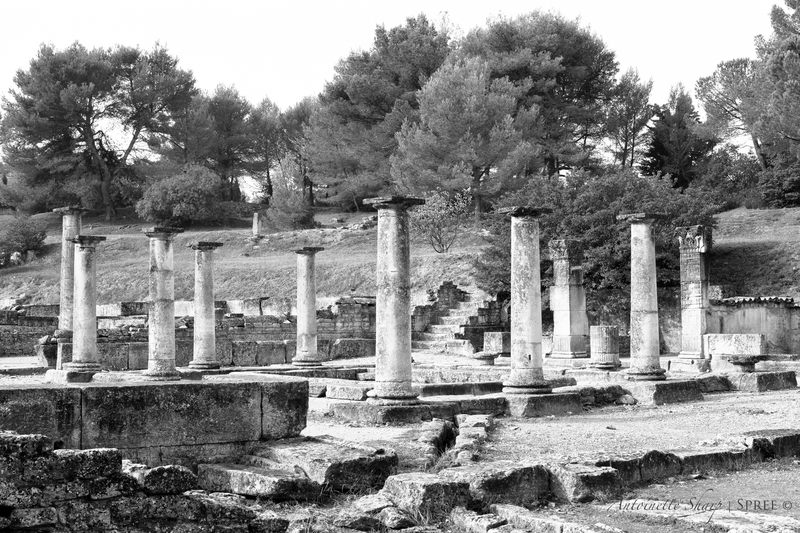 Subsequent to its settlement, relations with the Greek world brought wealth to Glanum’s inhabitants. As a benefit, the inhabited zones, as well as the sophistication of the architecture, expanded greatly. 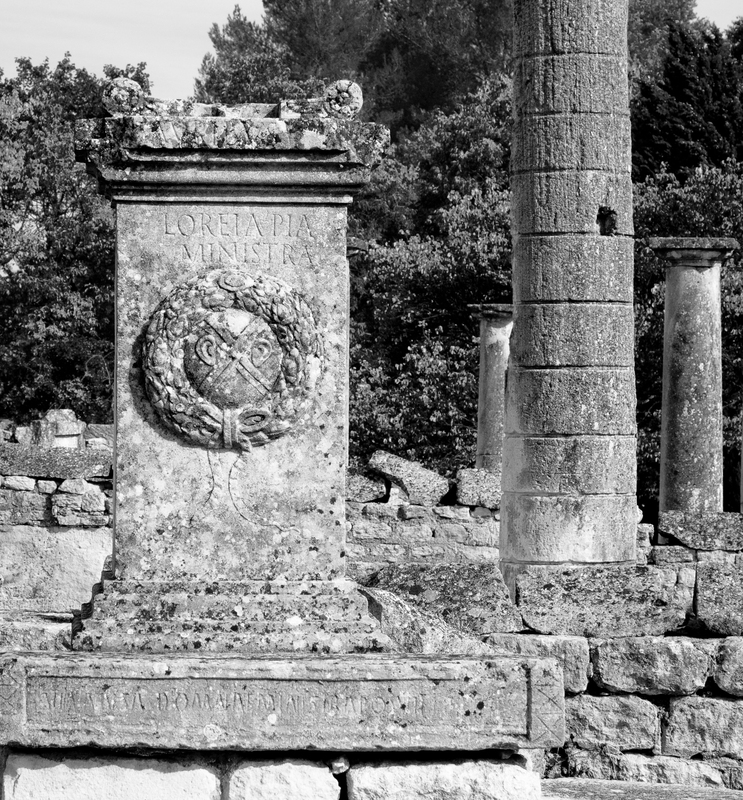 Doubtful that the people were too pleased with the turn of events, but Glanum “changed hands” and became a Roman colony around the turn of the millennium. During this time there was a profound transformation of the city’s monumental architecture. 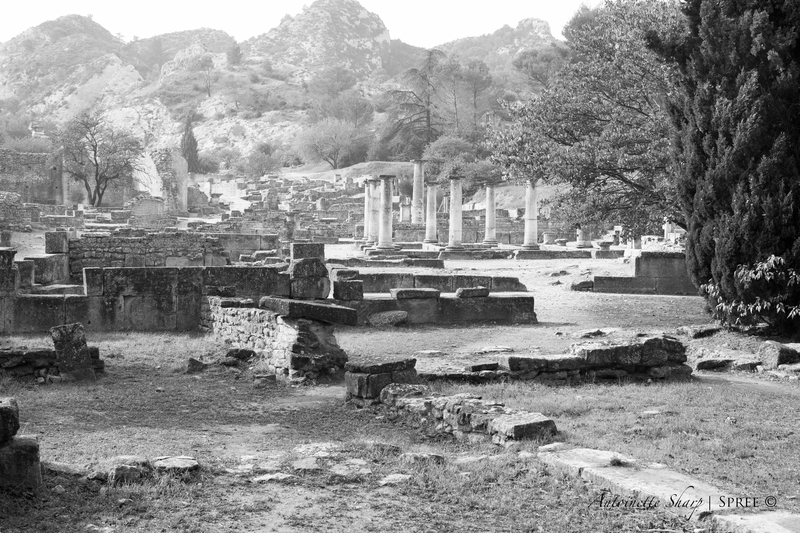 Glanum was incapable of surviving the fall of the Roman Empire and the invasions of the Alamanni however. In the year 260 A.D. it was abandoned by its residents in favor of the nearby agglomeration which would later become the village Saint-Remy de Provence. The sophistication, especially the elaborate and separate clean-running and waste water systems and thermal baths, so impressed us. 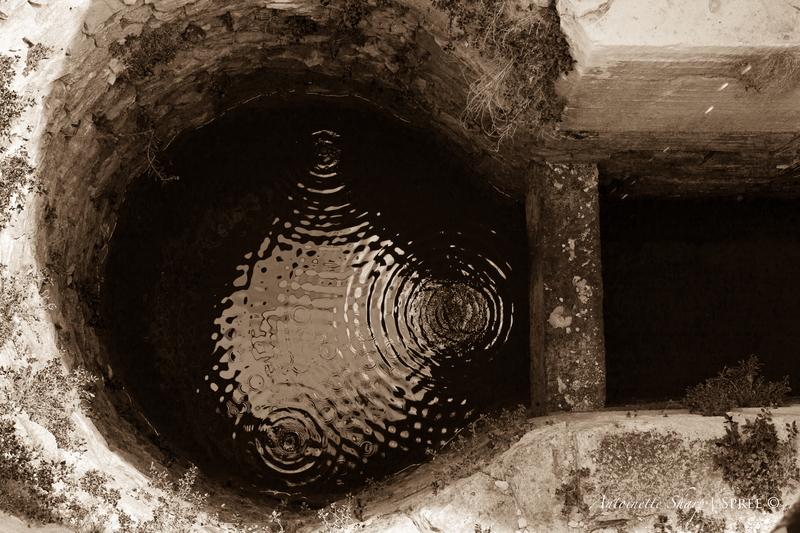 A mask formed the fountain flowing into the sacred healing pools. 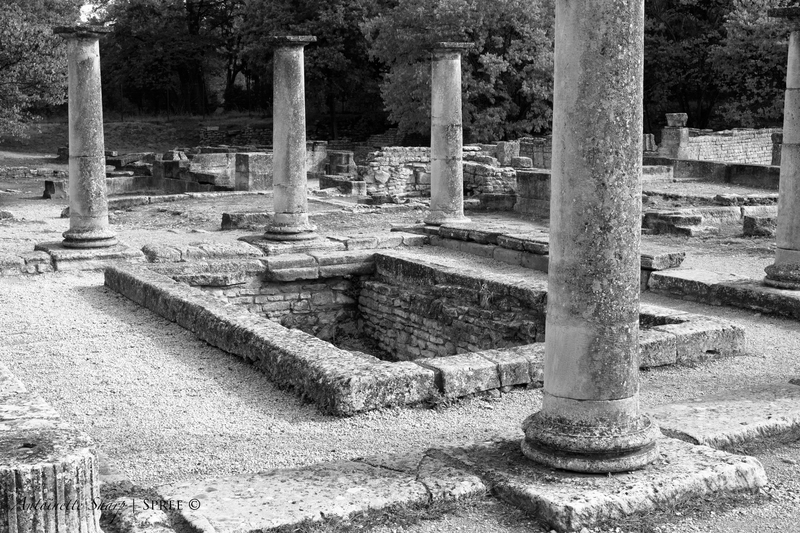 The remains of a Hellenistic residence, and the catch basin for collecting rain water. 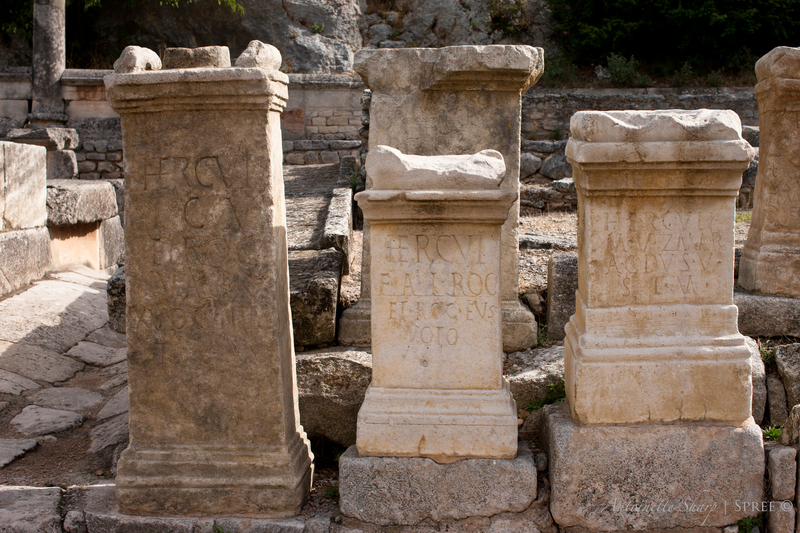 Votive stones dedicated to Hercules, thought to be the protector of the sacred spring. 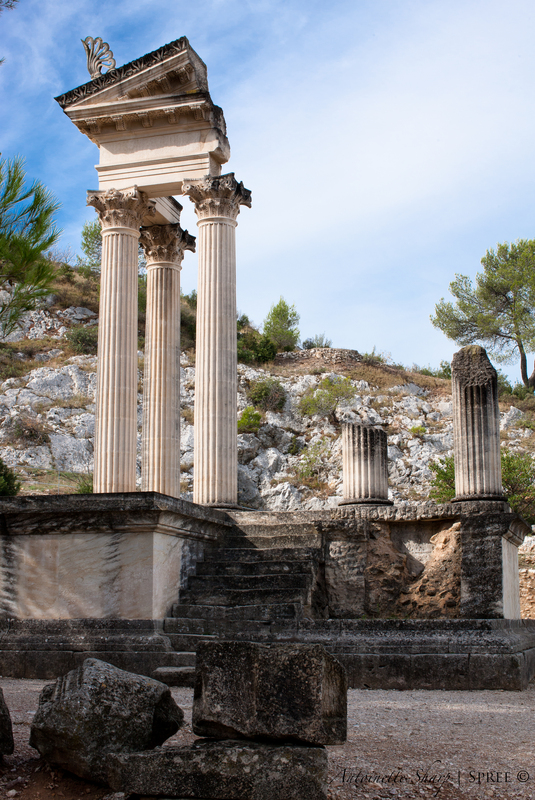 So that, my friends, is Glanum. Where we had been headed, before Guinea screeched on the brakes, was Pont du Gard, the famous Roman aqueduct in southern France. 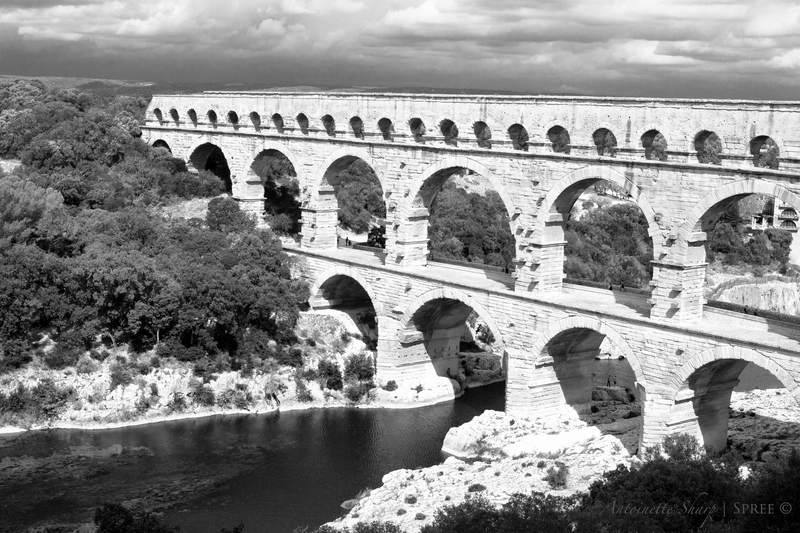 The Pont du Gard was built shortly before the turn of the millennium to allow the aqueduct of Nîmes (which is about 30 miles, or 50 km, long) to cross the Gard river. The Roman architects and hydraulic engineers who designed this three-level bridge, which stands almost 50 m high – created a technical as well as an artistic masterpiece. It still stands, as originally built. So well was it engineered and constructed that in all these two-thousand years no re-building or shoring up has ever been necessary. 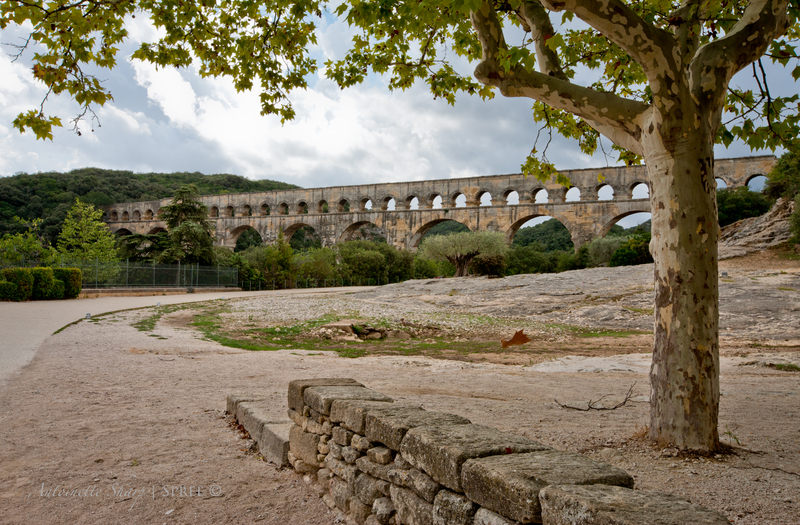 Because Pont du Gard is a Unesco World Heritage Site it’s well-protected and universally accessible. 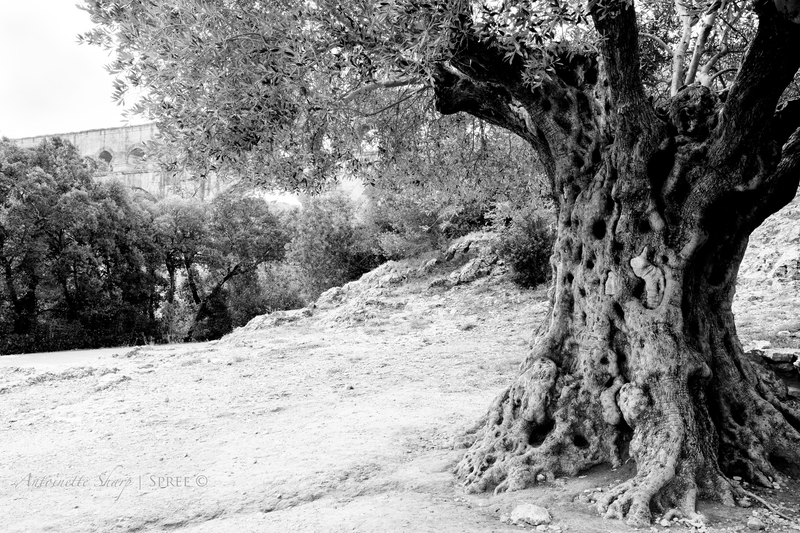 On the path that leads to the bridge rises an ancient olive tree. From above the river Gard – do you see the people on the middle section of the bridge, to the left? That gives you an idea of the scale. We spent a couple hours walking and climbing and then headed back to Saint-Remy. It was time to fill our empty bellies. So, with the next post, food! ps…a note on the photos…I’ve indicated on a couple of them that opening them fully by clicking them will reveal much that isn’t seen until you do. it’s actually true of all of them, but some benefit even more from a closer look. you can test it out on the photo immediately above. Oh Spree what a wonderful experience, for me reading your post and of course for you guys. Ruins – be the Greek or Roman are fabulous, and this looks like a very well preserved site, and how splendid it must have been! 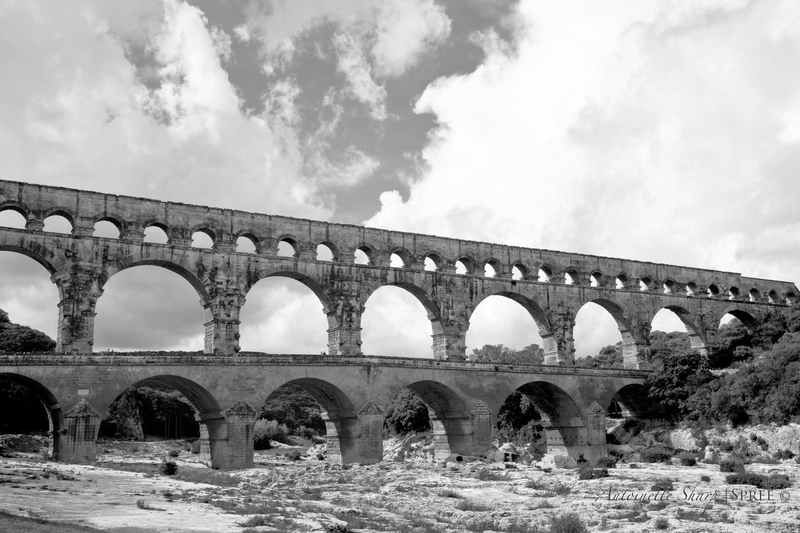 And the aquaduct is simply stunning, you are making me want to travel again….. ! So amazing to behold!Relics of a thinking past . Relics of a thinking past…I love that MariAnna! thank you! What beautiful photos of incredibly beautiful scenes. You’re a real blogging friend for bringing me along on your trip. 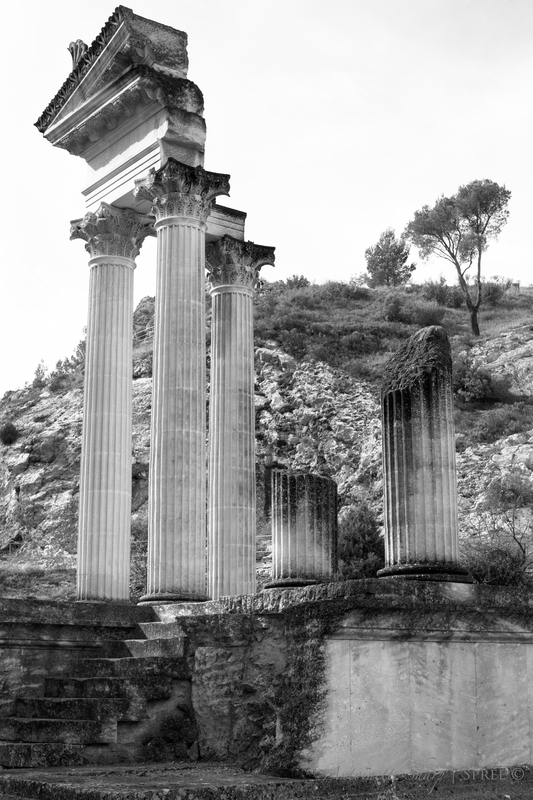 I got chills when we rounded the corner and came upon the ruins of Glanum. Your photos help us feel like we’re getting to poke around in the remains, to feel the comings and goings, the laughing, crying, arguing, playful shouting of ancient inhabitants. Oh, I would love to spend hours there! 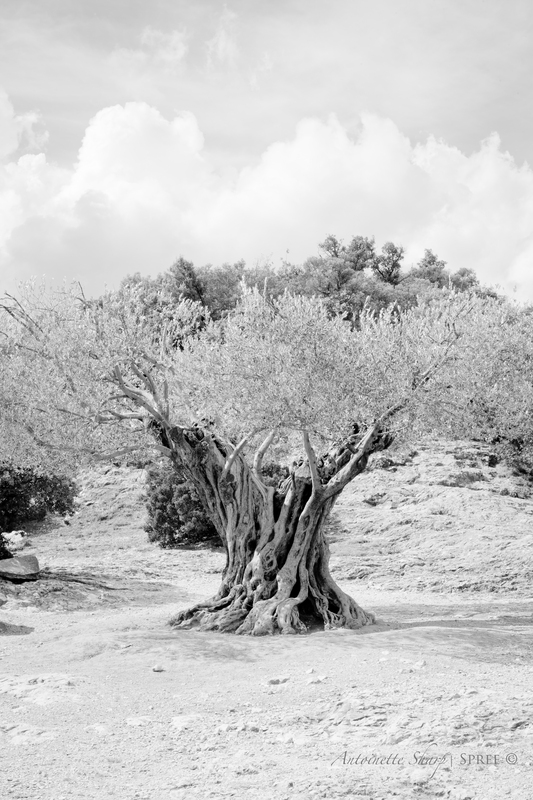 Then, through gnarly olive trees to the magnificent pont du gard. It seems to rise out of the land as if formed by the earth. I love the last shot where land and bridge shimmer sepulchre white against sky and leaves. Delicious lunch, Spree! 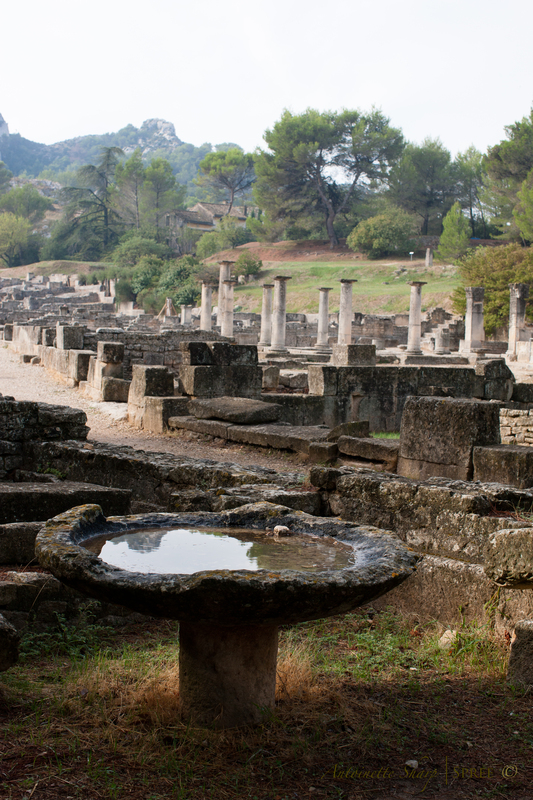 Rounding that corner onto Glanum gave us chills too Carolyn. The smoke that hung in the air felt like it had to come from the open ovens of the “people” cooking there, and being there all alone for a while allowed us persist in the fantasy. It was Wonderful, and we Did spend hours there. So very happy you had your lunch here! Your passion and creativity are evident everywhere. This little slice of France’s past comes to life thanks to your artistic skills. Your style and grace serve you well. France could not have a better cultural ambassador! Merci. OK, I appreciate it very much, but you are FAR too kind! MANY could serve as better (and far more knowledgeable) cultural ambassadors – all I can say is I loved almost every moment I was there! You’re absolutely right on the passion part! 🙂 (I make a very happy tourist!) Thank you so much Pete! Oh, Spree. I just love this stuff! 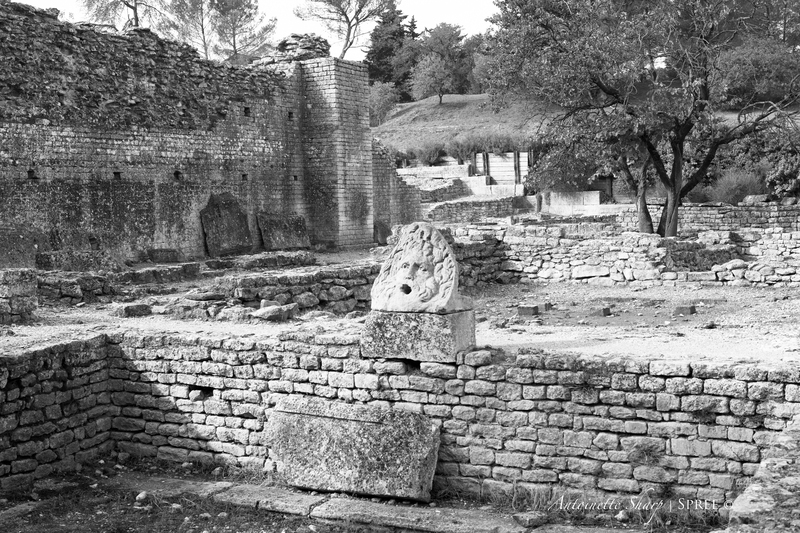 I could have gone back to Glanum daily for a week without tiring of it. I’ve never seen a Greek, Roman, or Egyptian ruin that I didn’t find utterly fascinating. Oddly enough, just this afternoon I was going through some photographs and came across some photos of similar subject matter. I was distracted all afternoon. I just cannot help myself. 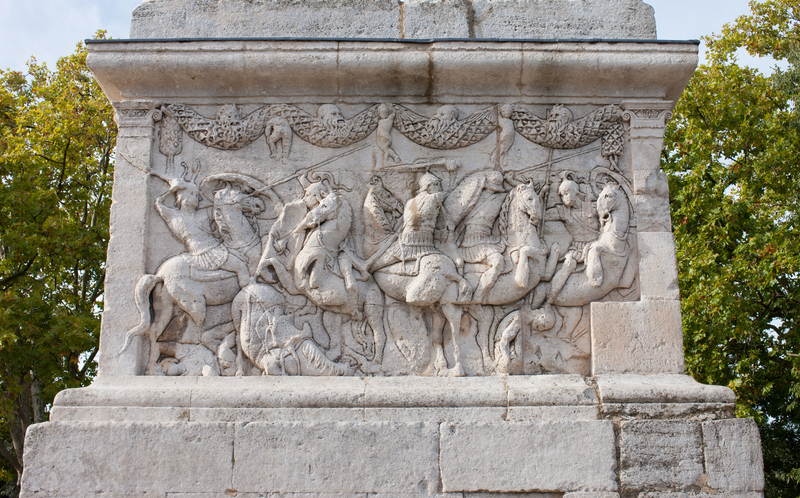 I’m glad you left Glanum with plenty of time left to take in the aqueduct at a leisurely pace. That must have been something to see. Thank yo so much for sharing this part of your trip with us. I very much enjoyed it. I’m preparing a special post and while looking for some photos I came upon some pictures that I’d forgotten I had. Yes, I’ve been to Egypt in October, 1998. My Traveling Companion and I flew into Alexandria from Istanbul and, after a couple days, went onto Giza where we joined a tour group and cruised up the Nile to just before the Aswan Dam. Along the way we saw, the Pyramids & Sphinx, Luxor, Memphis, a few tombs within the Valley of the Kings, and a few other, lesser known sites and temples. It was, for me, a dream. A highlight, among many, was seeing a performance of Aida at the base of the Pyramids on the evening before we joined the tour. Some 600 performers and musicians were involved in the production. It was an incredible experience. What an amazing (Amazing!) trip that must have been. And, as if the rest of it weren’t fantastic enough, Aida at the base of the pyramids! I can barely imagine how glorious that must have been and yet I just got goose bumps all over! Incredible! You’ve given me something new to dream about John – and I thank you! I saw the first photo and it is the iconic photo to remember Saint Remy by. I do love all the history in that area…especially when roads have been built around them so they are preserved forever. I always find it amazing that our forefathers have created such beautiful things. Today, beautiful things have taken different form. But how each generation can craft wonderful creations…I find it really, really amazing. I love too the way our ideas of what’s beautiful evolves or changes completely over time, but from every period in history something of beauty remains. It seems a human need to find and give expression to the beauty we see. No wonder Vincent was so inspired, eh? OH Ani, Thank you, Thank you, Thank you for taking me on this lovely journey. Words fail me in relating just how much it means to share in each other’s worlds in this way. Carving out moments to read your blog and Ashley’s is a special, familial joy to my heart to know I can be connected and read between the lines. Because I know you so well, it is easy to get inside your delight and hang out there with you as I savor the richness of the story! Thinking of you approaching Thanksgiving and glad we are connected so I get to share with you and the girls as family. Huge Hugs around you and your guinea! Thank you so much Kelly for such warm thoughts and always for your encouraging words. I’m very happy to have you along for the journey – and by no means do I mean just this trip. My best to you Kelly, dear friend, and love! Looks like you caught the mask yawning with your unexpected visit 🙂 Loved zooming in to see the puny humans on the bridge! Absolutely gorgeous – especially the ever-flowing spring, I love the interlacing ripples. Oh thanks so much Giovanna for sending the link! Quite beautiful that is! And so near you…how lucky! Really happy you’re along for the trip! Spree, your photos are exquisite. I feel like I’ve bee in these marvellous places (in the true sense that I marvelled at what I saw). Thank you so much for sharing. Mar, I appreciate so much what you’ve said! I so agree that to “be” fully in a place means to marvel! Thank you so much for saying it, and I’m delighted you’re following! How magical and what an incredible place. NNot somewhere I knew about but am already trying to work out if we could take a different route home through France when we eventually head back to Spain! Self serving indeed – you are doing us a great service and giving us great pleasure with these wonderful posts! Fantastic photography! Brought these ruins back to life, if only for a moment. Great job! It seems like a delightful adventure, spree. When I visit such ruins, I’m often reminded of the history I once learned, and imagine the lives that people lived in such places. Very interesting. This a part of Provence I have yet to see. Your photos are just lovely, seeing them as you discovered the sights on the day is a lovely way to present the experience. I feel the same – the fascination with the past and I get quite irritable and selfish 😉 when I find places like this and just hate it when someone turns up! I want it all to myself so I can immerse myself into ‘that’ time.